AA Mail Server is an easy to use dedicated database based Windows email server software and Web mail server software with full featured mail service. AA Mail Server software is great for small and medium-sized companies (1~20000 accounts) to build their own mail systems on LAN and Internet. 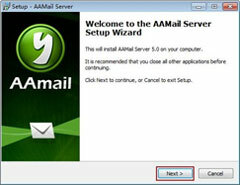 AA Mail Server is very easy to setup and configure, you could make your mail server ready within only several minutes. AA Mail Server gives your organization the tools that it needs to succeed, it helps create a powerful mail system easily, and you can be up and running it in minutes. Your mail system becomes more powerful with AA Mail Server's great features, such as multiple deploy modes, powerful mail monitor function, mail auditing, anti-spam function, third party mail clients, multiple languages, remote receiving mails... Now, a mail server helps your business become more successfully! Database-based is the greatest feature of AA Mail. Both of Access Database and SQL Server Database are supported on AA Mail. AA Mail supports LAN server mode, Internet server mode, map mail server mode and share mail server mode. Mail monitor is one of the powerful functions of AA Mail. It supports monitoring all accounts or specified accounts, or only monitoring outgoing list or incoming list. Mail auditing is a special function in share mail server mode. The mail server holds the mail temporarily, and then the manager decides whether to allow sending. AA Mail has a great anti-spam function. It supports anti-spam via RBL, mail server IP, domain name black/white list and SPF. AA Mail supports all third party mail clients, such as Outlook Express, Office Outlook and Foxmail. Adopted the UTF-8 technology, Webmail on AA Mail supports multiple languages, which has a very important significance in international communications. The Webmail network disk function supports uploading files to the server, and checking, sharing, downloading the files anytime and anywhere. Mail group is very powerful and easy to use. AA Mail supports a mail group being the member of another group and creating multiple mail groups. AA Mail has a powerful ISP relaying function which ensures send and receive overseas mails normally. Supports simultaneously receiving a number of different accounts’ mails, and then put them together into AA Mail server. AA Mail owns very useful and a variety of detect and diagnose functions, which helps targeting the problems quickly. Supports database + files storage. The mail index information is stored in the database, while the database files and the mails are stored in the "data" folder. Unlimitedly expand mail hosting and improve communication efficiency among employees. The headquarters provide a mail account for the branch to bind. AA Mail provides many APIs, which is very good for secondary development. It is also a perfect combination with ERP/OA system. If you want to use AA Mail's Webmail, then you need to install Windows IIS first. If you don't install IIS, you cannot use the Webmail to receive and send the emails successfully. Normally, IIS is installed by default on Windows 2003. If it isn't, please refer to "Install Windows IIS". CPU Celeron or above AA Mail is undemanding on CPU. RAM 4G or above The bigger of the RAM the better. Hard Disk 1T or above The email volume is growing, so the bigger of the hard disk space the better. OS Windows Windows 2000/2003/2008 Server, we recommend Windows 2003. Database SQL Server Access or SQL Server 2000/2005/2008, we recommend SQL Server 2000. Antivirus No Requirement AVG/Kaspersky/Rav, we recommend AVG. For most enterprise users, we recommend Windows 2003 Enterprise Edition + SQL Server 2000 Standard Edition/Enterprise Edition. For the AA Mail trial users, we recommend Windows OS + Microsoft Access. It is very easy to install AA Mail server. Click the "Next" button until finish. The setup wizard of AA Mail is very helpful, you just need to follow the instructions until finish the processes. If you need more clients, you can purchase a license code. 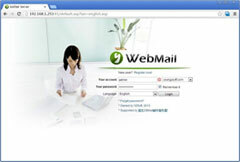 Try Windows Email Server Software - AA Mail to Build Your Own Internet Mail Server Now!